What are waterways, rivers, estuaries and wetlands? The term algal blooms may be used to describe macroalgae, which are large visible free floating or rooted plants, or microalgae which require a microscope to see but in mass are highly visible. Both macroalgae and microalgae (phytoplankton) are natural and desirable components of aquatic ecosytems. 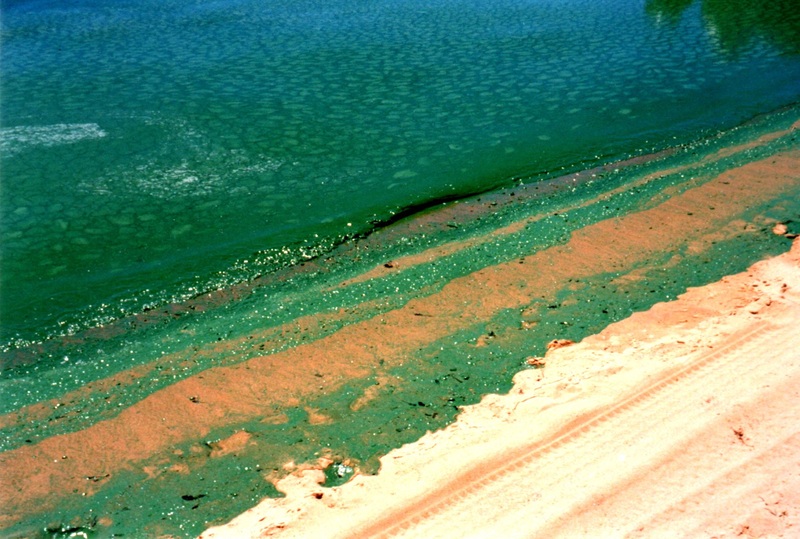 Algal blooms are natural phenomena that occurred before human development in response to changes in temperature, light, rainfall, or changes in limiting nutrients. Watershed clearing, agriculture and urban discharges, which add more nutrients, light and organic matter have led to increased frequency and duration of algal bloom and in some cases a switch to more toxic species. Persistent and widespread blooms lead to loss of biological function of the waterway. Extreme macrolagal growth can completely dominate an estuary or river such as in the Peel Harvey during the late 1980s and in the Oyster and Princess Royal Harbours. In these cases macrolagal blooms shaded seagrasses and led to their loss or decline. In some cases phytoplankton can also dominate and cause ecosystem collapse. In the Peel Harvey in the 1990s the toxic phytoplankton Nodularia Spumigena replaced the macroalgae that had smothered the seagrasses. We refer to nuisance algal blooms as those that discolour the water and which may leave residue on the skin of swimmers. The term harmful algal bloom is used for those phytoplankton that sometimes produce toxins that affect either aquatic life, such as fish, or even human health. Harmful algal blooms (HABS) are a global problem often in the areas of shellfish cultivation or aquaculture. Many of the produced algal toxins enter the shellfish and pose a serious human health risk leading to many deaths in Europe and the United States. For natural waters, surveillance of phytoplankton is undertaken state wide in at-risk rivers and estuaries under the department's Statewide Algal Management Strategy. The Department of Water, in partnership with the Department of Health, has developed a statewide algal bloom response protocol. We also work with Department of Fisheries in accordance with the Fish Kill Response protocol. In the event of an algal bloom samples are collected and sent to the department's Phytoplankton Ecology Unit. Samples are analysed and the Department of Health is contacted if necessary. The Department of Health liaise with relevant local governments to issue a health warning when required. the Swan River Trust (for the Swan Canning Riverpark) on 9278 0900 or after hours on 0419 192 845. Contact with some algal species can be harmful for humans and pets - if you notice signs of an algal bloom it is recommended that you and your pets do not go swimming. Some species of algae produce a toxin that can contaminate wild shellfish and make them unsafe to eat. See the Department of Health website and see Algae: Blooms, Scum and Recreation.